The mobile data acquisition MDA devices of the Zebra 3100 series demonstrate outstanding performance in terms of real-time data collection, as they are individually adjustable to the requirements of various areas of application due to a large variety of equipment models. The ergonomic design allows the user to work particularly efficiently and effectively, offering maximum handling comfort. Thus, the MC3100 particularly stands out as a mobile data processor in the retail industry, in gift shops, at loading ramps or in transport. An integrated RFID tag automates asset tracking, allowing enterprises to track and locate MC3100 devices right out the box. Zebra's Interactive Sensor Technology (IST) provides an integrated accelerometer that enables leading edge motion-based applications that improve power management and more. Robust security features include FIPS 140-2 certification, protecting the most sensitive data. Compatibility with the existing MC3000 accessories ecosystem enables organizations to upgrade to the latest in technology, while preserving the existing accessory investment. The result is a robust affordable device that will help retailers, government agencies and distribution centers streamline and error-proof business processes, improving employee productivity as well as customer service and satisfaction. High performance through the Marvell PXA320 processor with 624 MHz, 256 MB RAM, as well as a flash memory of up to 1 GB are always a convincing argument, leaving a wide range of application options. The memory can be extended at all times via the integrated SD/MMC card slot. The integrated Wi-Fi interface 802.11b/g/a provides your client with flexibility in terms of all data transfers. Equipped with an imager, the terminal reads all current 1D and 2D bar codes. In order to read one-dimensional bar codes particularly quickly and flexibly, the laser scanner version is optionally equipped with a rotary scan head. The choice of different versions with pistol grip and various keyboard layouts with 28, 38 or 48 keys further improves ergonomics and productivity comfortable and fatigue-free handling is guaranteed even for long shifts in scan-intensive environments. Due to its rugged construction, the Zebra MC3100 is fit to endure daily use also in difficult surroundings. It easily withstands tough challenges, such as dust, humidity and extreme temperatures. Zebra MC3190-Z, Wi-Fi, UHF RFID Reader, WM6.5, 1D, 48K, 4800mAh BAT - Windows Mobile 6.5, 1D Laser Barcode Scanner, Wi-Fi (802.11a/b/g), 256MB/1GB, 48 key Keypad, Bluetooth, 4800 mAh High Capacity Battery. Interface cables and charging cradle sold separately. 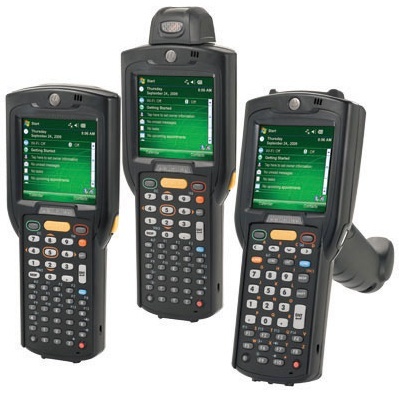 Zebra MC3190-Z, Wi-Fi, UHF RFID Reader, WM6.5, 1D&2D, 48K, 4800mAh BAT - Windows Mobile 6.5, 2D Imager Scanner, Wi-Fi (802.11a/b/g), 256MB/1GB, 48-key Keypad, Bluetooth, 4800 mAh High Capacity Battery. Interface cables and charging cradle sold separately. Zebra charger kit - Charger kit, incl. universal battery charger, four battery adatpers, for Zebra MC3000, charges up to four MC3000 batteries.